Sorry about the image quality, it was photographed in bad light and heavily compressed to reduce the file-size. 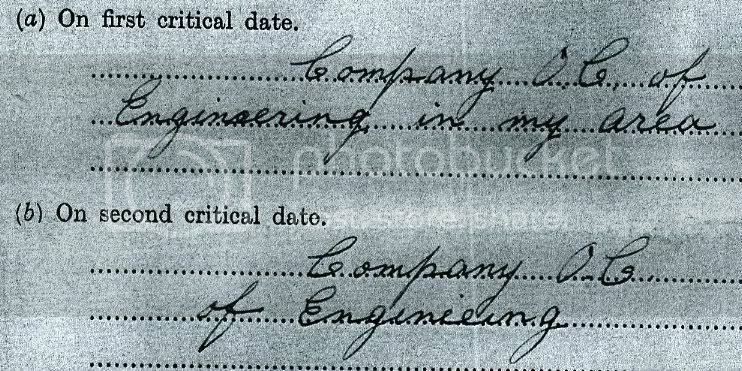 What exactly was the function of his unit - "Engineers"? Would it be the same as a regular military unit of engineers? And the illustration of the badge behind the tricolours - similar to the Republics cap badge, is this what it represents or was it of a different design? I'm not too clued up on these kind of insignia. It is very unusual to see a unit designation like "Engineers", the normal description was just x Battalion, y Brigade. In the context of the Anglo Irish War IRA, engineers would possibly have been bomb makers or else blokes who dug up roads to create barricades etc. The symbol is a representation of the cap badge, the Dublin Brigade cap badge was almost identical to the modern FF badge. I have a photo of his grave and also one of his funeral heading down emmet Road Inchicore, Dublin if you are interested. There is also a memorial on the spot in which he was shot. Permission I belive is required here as its now in the middle of a golf course. would you mind emailing them to me to post? langton39@hotmail.com and I'll send them on. Do you have anything else yourself on the 4th Battalion? I am sure you will enjoy these blokes and their kowledge as much as I have. As a relatively newbie myself welcome too to the waters of nothing-is-too-big-to-post. You'll figure it out I'm sure, trial and error, but start by getting the resolution down to about 150 and work on the target size - 110 x 100 or something close to it. BUT BEWARE THAT THE EPSON-EERS DONT CATCH UP TO YOU! I forgot to ask -shot by the British army shot as in acation, or executed? In action, I think by the choice of wording? on a training weekend with his unit, the 5th engineers. 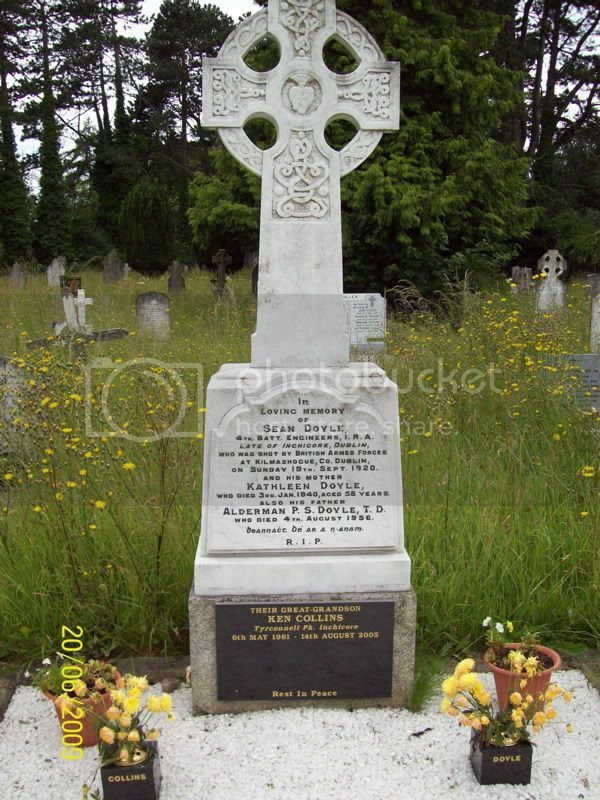 Posting these images of Sean Doyle's grave for James1964. Thanks James, it's nice to see his final resting place. hello danny did u know there was a poem written about sean doyle. 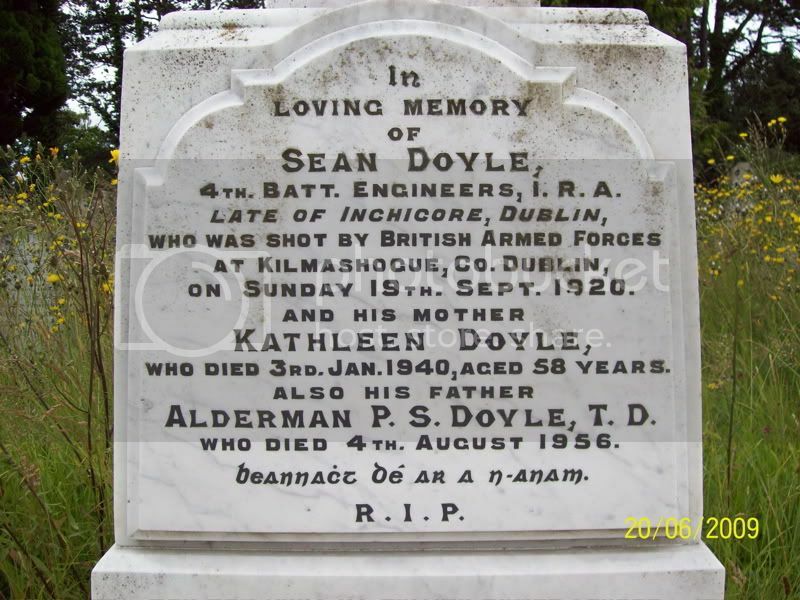 by another f co. man and living in inchicore at the time councilor sean o concubhair a friend of peader doyle. a tribute to sean doyle. the kincora book of verse. published by talbot press 1928. Welcome to the site, not too long here myself, and I must add a nice bunch of chaps here. Do you have a copy of that poem by any chance? Or indeed anything on the Fourth Battalion especially F coy? Doing a project on them at the moment and would be greatful for any information or articles etc on them. I hope my first post is of interest here. I've taken excerpts from my maternal Grandfather's Military Service Pension Application form. They clearly support Paul L Murphy's description of 'Engineers' from this period. Also they show, in this particular case, 'Engineers' to be a small unit within my Grandfather's company, going on to form a larger body at Battalion or Brigade level. Very interesting, as is obvious from what I asked in previous posts(& the replies), I wondered whether engineer meant part of a body of men, or an individual "specialist". Just seeing this thread now, & that is a very interesting card. Here is a very small addition ot the thread. 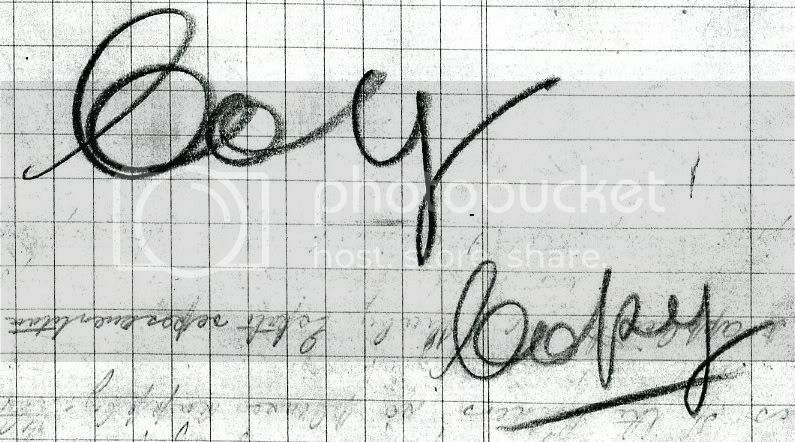 His father Alderman Peadar S Doyle was a friend of Vincent Byrne (Comdt. 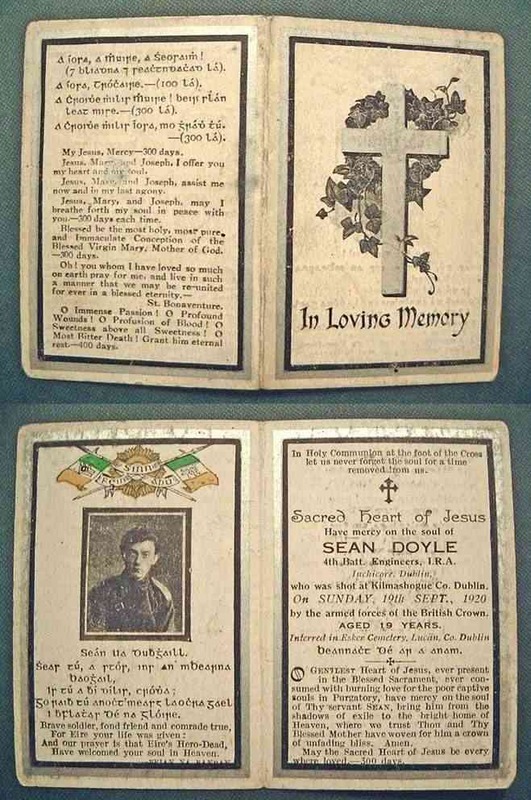 Vincent Byrne II Bn, Dublin Brigade, Old IRA - of Michael Collins' Squad) here are a couple of christmas cards from him to V.Byrne.